The Dnepr rocket, a weapon of war converted for peaceful applications, bolted out of an underground silo early Friday and delivered five German agricultural imaging satellites to orbit. 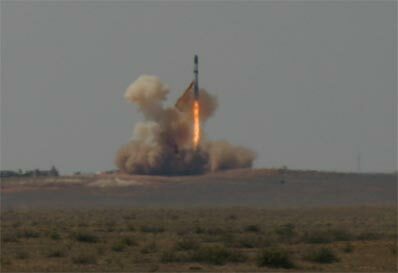 The 111-foot-tall booster lifted off at 0715:58 GMT (3:15:58 a.m. EDT) Friday from the Baikonur Cosmodrome in Kazakhstan. The Dnepr's third stage later released the five satellites nearly 400 miles above Earth. Officials reported the satellites had begun contacting ground stations less than two hours after launch. The spacecraft will be activated and tested in the next few weeks before entering operational service later this year for RapidEye, a German company that will sell imagery gathered by the satellite fleet. Engineers will let the craft drift apart to reach an orbital spacing of about 19 minutes, allowing frequent revisits over the same area. The satellites, each weighing about 330 pounds at launch, will spend more than seven years circling the planet downloading more than 1.5 million square miles of imagery per day, according to RapidEye. The constellation will produce color imagery with a resolution of about 21 feet, but RapidEye officials say the system will be differentiated by rapid response and timely products for the agriculture industry. "The Earth observation data obtained with our system is the basis for important management information services that haven't been commercially available until now, especially in the agriculture and forestry industries," said Wolfgang Biedermann, CEO of RapidEye. The fleet will be able to cover any place on Earth within one day and image all agricultural regions of Europe and North America within five days, according to RapidEye. "We will be able to deliver data about a customer's area of interest as often as they need it, quickly and at a very competitive cost," Biedermann said. RapidEye's primary applications include monitoring crops and giving farmers, insurance companies and disaster relief organizations critical information following a natural catastrophe. "We will be able to deliver imagery and services to our customers for crop planning, crop identification and damage assessment following a natural disaster," said Biedermann said. RapidEye was co-founded in 1998 by Vereinigte Hagel, a European agricultural insurance firm. "As soon as the long-awaited data is available, we will have precise information about crop conditions before, during and after a storm and how they develop afterwards," said Dietrich Heine, CEO of Vereinigte Hagel and deputy chairman of the RapidEye supervisory board. "This is a quantum jump from the current damage assessment process." The quick data turnaround from RapidEye could mean faster insurance payouts to farmers suffering from natural disasters, officials said. The program's prime contractor, MDA Corp. of Canada, was responsible for the mission and spacecraft design and provided ground systems for image processing, said Daniel Schulten, MDA program manager for space missions. Surrey Satellite Technology Ltd., a U.K-based manufacturer of small satellites, built the RapidEye spacecraft. Jena Optronik of Germany provided the satellites' pushbroom imaging payload. Friday's launch leapfrogged another Dnepr mission that had been scheduled for earlier this month. That flight has been grounded twice by the objections of Uzbekistan and Kazakhstan, which refused to give clearance for the rocket's first stage drop zone within their territories. The suspended launch was to carry a Thai Earth observation satellite, and payload officials confirmed the delay earlier this month. The satellite, named THEOS, must launch on a southerly path from the Yasny missile base in southern Russia. "Originally the drop zone studied was planned to be in Uzbekistan, which didn't give authorization despite promising meetings and agreements elaborated in 2007 and 2008," said Matthieu Duvelleroy, a spokesperson for EADS Astrium, prime contractor for the THEOS payload. When Uzbekistan declined to give permission for launch, engineers began redesigning the Dnepr rocket's trajectory to drop the first stage in Kazakhstan. Kazakhstan's national space agency, Kazcosmos, authorized the new drop zone in a June message to Russia's Defense Ministry. Astrium and Kosmotras, the international company overseeing Dnepr launch operations, began final flight preparations in early July, according to Duvelleroy. Russian military officials informed Kazcosmos of the scheduled Aug. 6 launch two days before blastoff, but Kazakhstan replied saying the launch was prohibited, Duvelleroy said. Kosmotras is negotiating with Russian and Kazakh officials in hopes of clearing the stranded rocket for launch, Astrium officials said.